So thanks to seeing Michael Kapler’s implementation of David Varadi’s percentile channels strategy, I was able to get a better understanding of what was going on. It turns out that rather than looking at the channel value only at the ends of months, that the strategy actually keeps track of the channel’s value intra-month. So if in the middle of the month, you had a sell signal and at the end of the month, the price moved up to intra-channel values, you would still be on a sell signal rather than the previous month’s end-of-month signal. 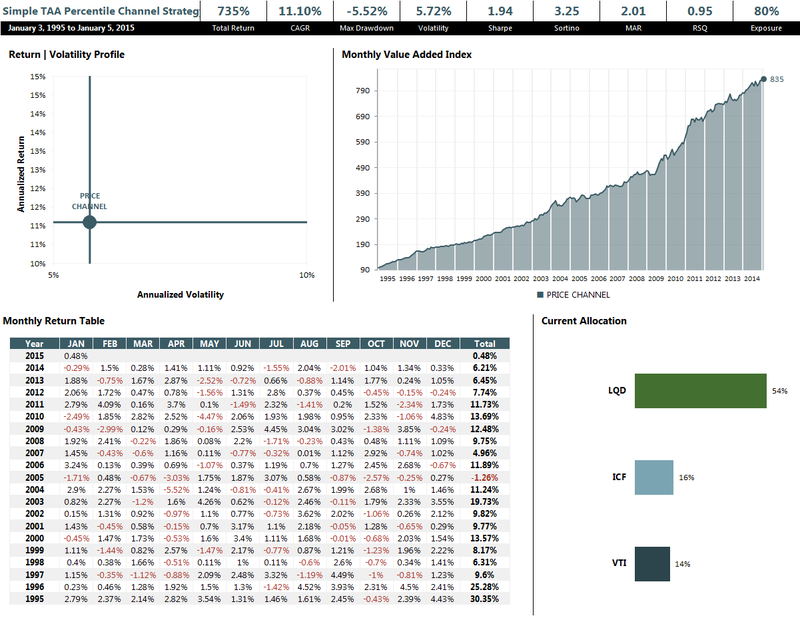 It’s not much different than my previous implementation when all is said and done (slightly higher Sharpe, slightly lower returns and drawdowns). In any case, the concept remains the same. For this implementation, I’m going to use the runquantile function from the caTools package, which contains a function called runquantile that works like a generalized runMedian/runMin/runMax from TTR, once you’re able to give it the proper arguments (on default, its results are questionable). Essentially, with runquantile, you need to give it the “trim” argument, and then manually append the leading NAs, and then manually turn it into an xts object, which is annoying. One would think that the author of this package would take care of these quality-of-life issues, but no. 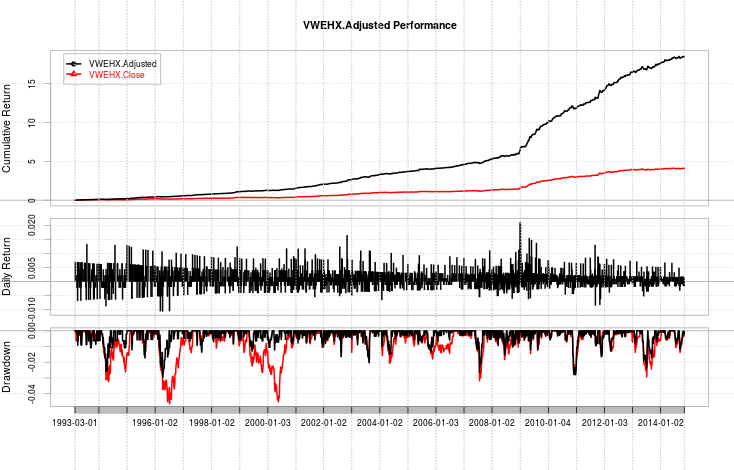 In any case, there are two strategies at play here–one being the percentile channel risk parity strategy, and the other what Michael Kapler calls “channel equal weight”, which actually *isn’t* an equal weight strategy, since the composite parameter values may take the values (-1, -.5, 0, .5, and 1–with a possibility for .75 or .25 early on when some of the lookback channels still say 0 instead of only 1 or -1), but simply, the weights without taking into account volatility at all, but I’m sticking with Michael Kapler’s terminology to be consistent. That said, I don’t personally use Michael Kapler’s SIT package due to the vast differences in syntax between it and the usual R code I’m used to. However, your mileage may vary. In short, the more naive weighting scheme delivers slightly higher returns but pays dearly for those marginal returns with downside risk. So, there you have it. The results David Varadi obtained are legitimate. But nevertheless, I hope this demonstrates how easy it is for the small details to make material differences. 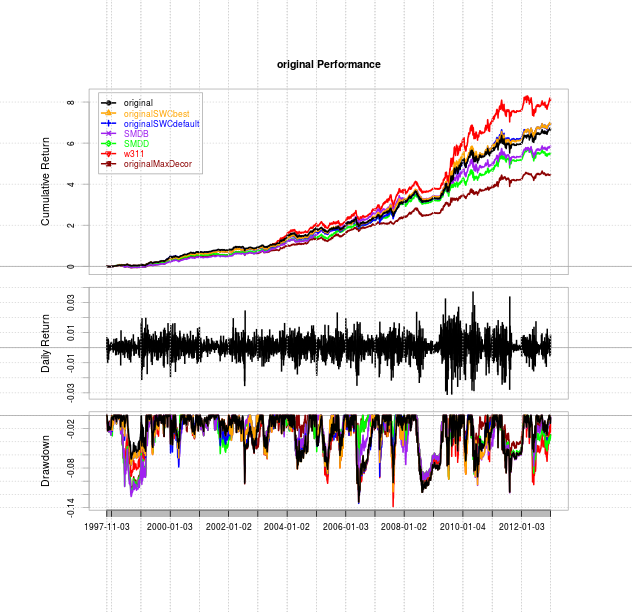 This post will detail an attempt at replicating David Varadi’s percentile channels strategy. As I’m only able to obtain data back to mid 2006, the exact statistics will not be identical. However, of the performance I do have, it is similar (but not identical) to the corresponding performance presented by David Varadi. First off, before beginning this post, I’d like to issue a small mea culpa regarding the last post. It turns out that Yahoo’s data, once it gets into single digit dollar prices, is of questionable accuracy, and thus, results from the late 90s on mutual funds with prices falling into those ranges are questionable, as a result. As I am an independent blogger, and also make it a policy of readers being able to replicate all of my analysis, I am constrained by free data sources, and sometimes, the questionable quality of that data may materially affect results. So, if it’s one of your strategies replicated on this blog, and you find contention with my results, I would be more than happy to work with the data used to generate the original results, corroborate the results, and be certain that any differences in results from using lower-quality, publicly-available data stem from that alone. Generally, I find it surprising that a company as large as Yahoo can have such gaping data quality issues in certain aspects, but I’m happy that I was able to replicate the general thrust of QTS very closely. This replication of David Varadi’s strategy, however, is not one such case–mainly because the data for DBC does not extend back very far (it was in inception only in 2006, and the data used by David Varadi’s programmer was obtained from Bloomberg, which I have no access to), and furthermore, I’m not certain if my methods are absolutely identical. Nevertheless, the strategy in and of itself is solid. 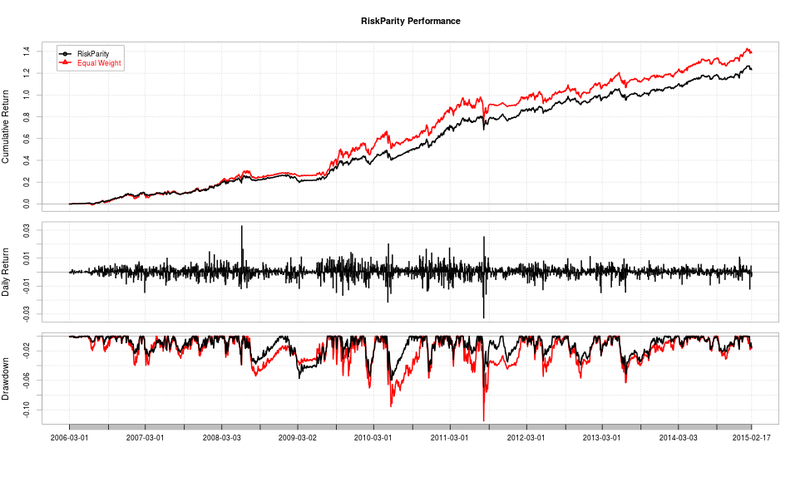 Find the running the n-day quantile of an upper and lower percentile. Anything above the upper percentile gets a score of 1, anything lower gets a score of -1. Leave the rest as NA (that is, anything between the bounds). Subset these quantities on their monthly endpoints. Any value between channels (NA) takes the quantity of the last value. (In short, na.locf). Any initial NAs become zero. Do this with a 60-day, 120-day, 180-day, and 252-day setting at 25th and 75th percentiles. Add these four tables up (their dimensions are the number of monthly endpoints by the number of securities) and divide by the number of parameter settings (in this case, 4 for 60, 120, 180, 252) to obtain a composite position. 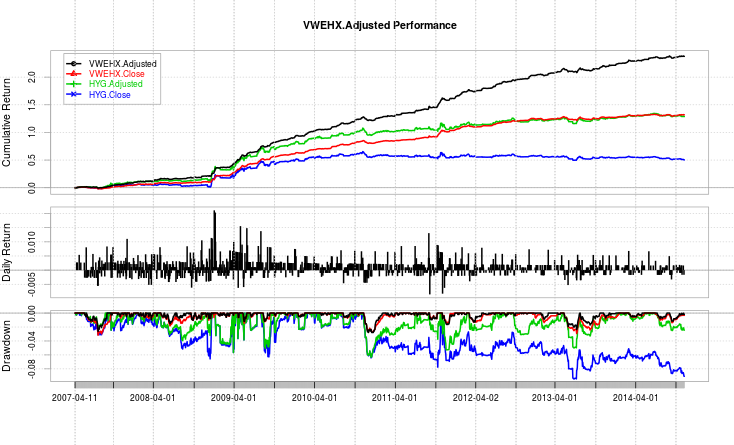 Next, obtain a running 20-day standard deviation of the returns (not prices! 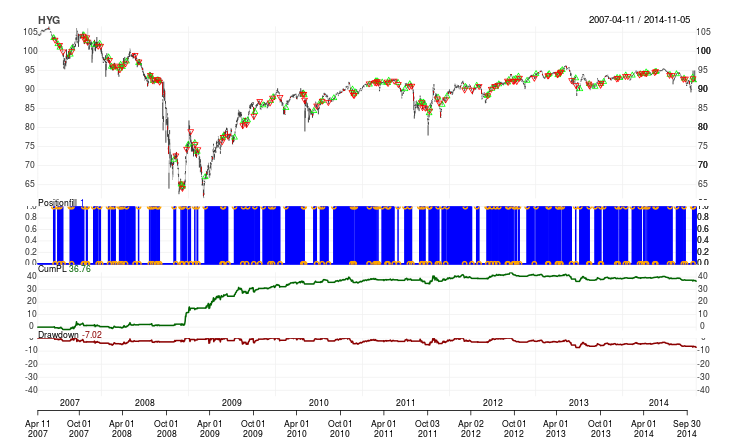 ), and subset it for the same indices as the composite positions. Take the inverse of these volatility scores, and multiply it by the composite positions to get an inverse volatility position. Take its absolute value (some positions may be negative, remember), and normalize. In the beginning, there may be some zero-across-all-assets positions, or other NAs due to lack of data (EG if a monthly endpoint occurs before enough data to compute a 20-day standard deviation, there will be a row of NAs), which will be dealt with. Keep all positions with a positive composite position (that is, scores of .5 or 1, discard all scores of zero or lower), and reinvest the remainder into the cash asset (SHY, in our case). Those are the final positions used to generate the returns. This is how it looks like in code. This is the code for obtaining the data (from Yahoo finance) and separating it into cash and non-cash data. This is the function for computing the percentile channel positions for a given parameter setting. Unfortunately, it is not instantaneous due to R’s rollapply function paying a price in speed for generality. While the package caTools has a runquantile function, as of the time of this writing, I have found differences between its output and runMedian in TTR, so I’ll have to get in touch with the package’s author. The way this function works is simple: computes a running quantile using rollapply, and then scores anything with price above its 75th percentile as 1, and anything below the 25th percentile as -1, in accordance with David Varadi’s post. It then subsets these quantities on months (quarters is also possible–or for that matter, other values, but the spirit of the strategy seems to be months or quarters), and imputes any NAs with the last known observation, or zero, if it is an initial NA before any position is found. Something I have found over the course of writing this and the QTS strategy is that one need not bother implementing a looping mechanism to allocate positions monthly if there isn’t a correlation matrix based on daily data involved every month, and it makes the code more readable. Next, we find our composite position. 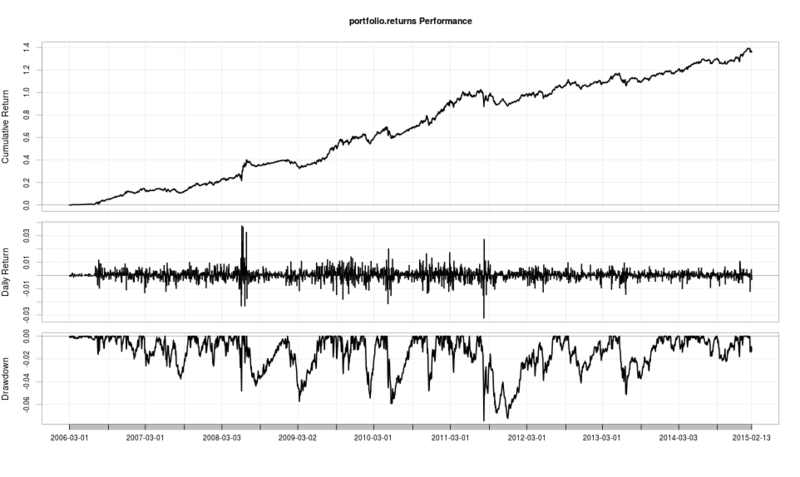 Next, find the running volatility for the assets, and subset them to the same time period (in this case months) as our composite position. In David Varadi’s example, the parameter is a 20-day lookback. Next, perform the following steps: find the inverse volatility of these quantities, multiply by the composite position score, take the absolute value, and keep any position for which the composite position is greater than zero (or technically speaking, has positive signage). Due to some initial NA rows due to a lack of data (either not enough days to compute a running volatility, or no positive positions yet), those will simply be imputed to zero. Reinvest the remainder in cash. And finally, the punchline, how does this strategy perform? I see a major discrepancy between my returns and David’s returns in 2011, but beyond that, the results seem to be somewhere close in the pattern of yearly returns. Whether my methodology is incorrect (I think I followed the procedure to the best of my understanding, but of course, if someone sees a mistake in my code, please let me know), or whether it’s the result of using Yahoo’s questionable quality data, I am uncertain. However, in my opinion, that doesn’t take away from the validity of the strategy as a whole. With a mid-1 Sharpe ratio on a monthly rebalancing scale, and steady new equity highs, I feel that this is a result worth sharing–even if not directly corroborated (yet, hopefully). One last note–some of the readers on David Varadi’s blog have cried foul due to their inability to come close to his results. Since I’ve come close, I feel that the results are valid, and since I’m using different data, my results are not identical. However, if anyone has questions about my process, feel free to leave questions and/or comments. Since I debuted the stepwise correlation algorithm, I suppose the punchline that people want to see is: does it actually work? The short answer? Yes, it does. The FAAreturns function has been modified to transplant the stepwise correlation algorithm I discussed earlier. Essentially, the chunk of code that performs the ranking inside the function got a little bit larger, and some new arguments to the function have been introduced. Using the “default” setting, the algorithm will start off using the security that is simply least correlated among the securities (that is, the lowest sum of correlations among securities). However, the “best” setting instead will use the weighted sum of ranks using the prior two factors (momentum and volatility). This argument defaults to using the best security (aka the one best ranked prior by the previous two factors), as opposed to the default. At the end of the day, I suppose the best way of illustrating functionality is with some examples of taking this piece of engineering out for a spin. So here goes! 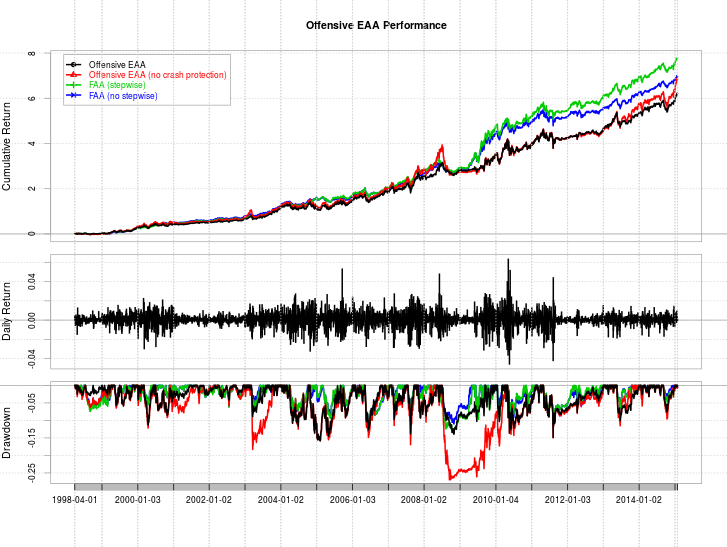 originalSWCbest: original weights, stepwise correlation algorithm, using the best security as ranked by momentum and volatility as a starting point. originalSWCdefault: original weights, stepwise correlation algorithm, using the default (minimum sum of correlations) security as a starting point. stepMaxDecorBest: a max decorrelation algorithm that sets the momentum and volatility weights at .05 and .025 respectively, compared to 1 for correlation, simply to get the best starting security through the first two factors. stepMaxDecorDefault: analogous to originalSWCdefault, except with the starting security being defined as the one with minimum sum of correlations. w311: using a weighting of 3, 1, and 1 on momentum, vol, and correlation, respectively, while using the stepwise correlation rank algorithm, starting with the best security (the default for the function), since I suspected that not weighing momentum at 1 or higher was the reason any other equity curves couldn’t top out above the paper’s original. 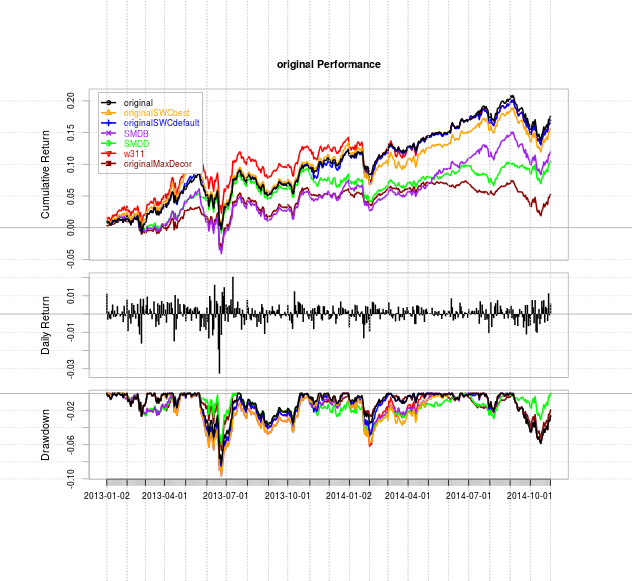 Does David Varadi’s stepwise correlation ranking algorithm help performance? From this standpoint, the answers lead to yes. Using the original paper’s parameters, the performance over the paper’s backtest period is marginally better in terms of the equity curves. Comparing max decorrelation algorithms (SMDB and SMDD stand for stepwise max decorrelation best and default, respectively), the difference is even more clear. However, I was wondering why I could never actually outdo the original paper’s annualized return, and out of interest, decided to more heavily weigh the momentum ranking than the original paper eventually had it set at. 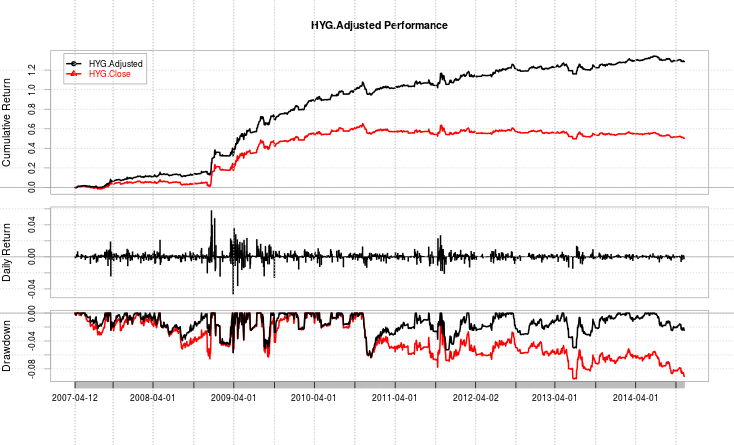 The result is a bumpier equity curve, but one that has a higher annualized return than any of the others. It’s also something that I didn’t try in my walk-forward example (though interested parties can simply modify the original momentum vector to contain a 1.5 weight, for instance). At the end of the day, all of the permutations exhibit solid results, and fall along different ends of the risk/return curve. The original settings exhibit the highest Sharpe Ratio (barely), but not the highest annualized return to max drawdown ratio (which surprisingly, belongs to the setting that overweights momentum). So, the original parameters are working solidly, the stepwise correlation algorithm seems to be in a slight rut, and the variants without any emphasis on momentum simply aren’t that great (they were created purely as illustrative tools to begin with). Whether you prefer to run FAA with these securities, or with trading strategies of your own, my only caveat is that transaction costs haven’t been taken into consideration (from what I hear, interactive brokers charges you $1 per transaction, so it shouldn’t make a world of a difference), but beyond that, I believe these last four posts have shown that FAA is something that works. While it doesn’t always work perfectly (EG the S&P 500 had a very good 2013), the logic is sound, and the results are solid, even given some rather plain-vanilla type securities. In any case, I think I’ll conclude with the fact that FAA works, and the stepwise correlation algorithm provides a viable alternative to computing your weights. 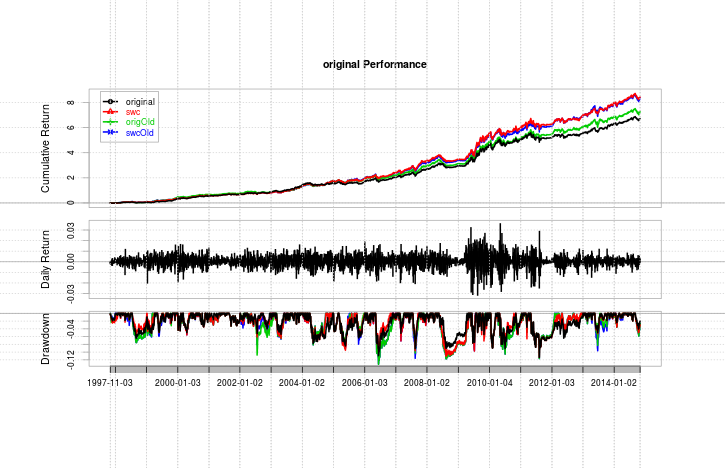 I’ll update my IKTrading package with some formal documentation regarding this algorithm soon.